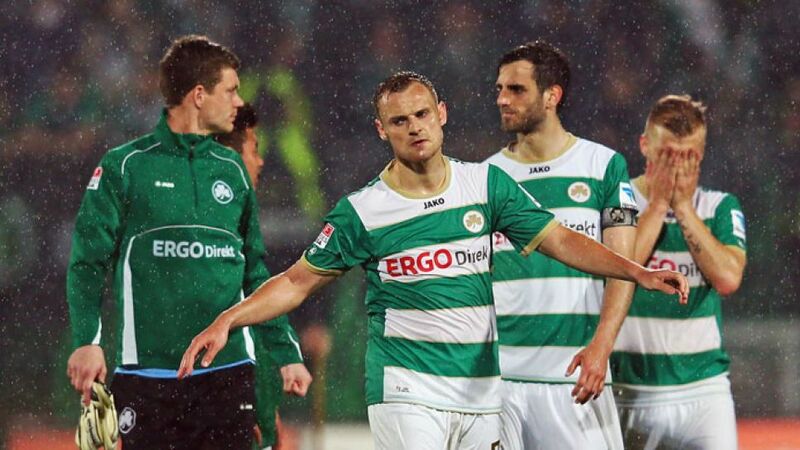 Fürth - It's mid-May and Greuther Fürth’s clash with SC Freiburg has just come to an end. The celebrations are under way, although once again they are taking place in the visitors’ section. The Black Forest outfit have won 2-1 at the Trolli Arena and Fürth's final wish - a maiden home win - has not been granted. “We wanted to give our fans at least one home win,” said captain Mergim Mavraj after the curtain came down. With a goal difference of -34, it is clear to see where the promoted side struggled most. With 60 conceded, they had obvious problems at the back, yet SV Werder Bremen and 1899 Hoffenheim had leakier defences and they both stayed up. Seventh-placed Hamburger SV also shipped 53 and almost qualified for Europe. Only six of their 26 goals came from forwards. Five were netted by Serbia’s Nikola Djurdjic, who was only signed in the winter break and, according to club chiefs, has got to be held onto at all costs. Ilir Azemi scored one, while Christopher Nöthe and Gerald Asamoah drew total blanks. Nevertheless, Fürth’s away record was better than could be expected from a rock-bottom club. With four wins on the road (at 1. FSV Mainz 05, FC Schalke 04, 1. FC Nuremberg and VfB Stuttgart), Fürth’s 17 points on their travels places them in a respectable 11th position in the away form standings. On 20 February, the coach of their successful promotion campaign Mike Büskens had to pack his bags. President Helmut Hack and the club’s decision-makers saw therein the only chance of turning a corner after the Clover Leaves had ended the first half of the season rooted to the foot of the table. Former reserve team coach Frank Kramer was appointed on 11 March and fitted out with a contract until 2015. Kramer, who had also worked in the Clover Leaves’ youth academy between 2004 and 2011 and therefore knew the club inside-out, was given the responsibility for heralding a new beginning - albeit in Bundesliga 2. A good dozen players will leave Fürth this summer, including some of their homegrown talents such as Felix Klaus, who is heading to SC Freiburg. Kramer will now have to build a strong troop around the backbone formed by Mavraj, Djurdjic, Stephan Fürstner and goalkeeper Wolfgang Hesl, feeding in players from the youth academy he knows so well. The fans should give him time to do that - especially after he helped provide the biggest moment of joy of the season: On 21 April, Fürth won 1-0 at neighbouring Nuremberg. Although their relegation to Bundesliga 2 was already confirmed, thousands of Fürth fans celebrated along the city’s bustling Gustavstraße as if they had just won the title.